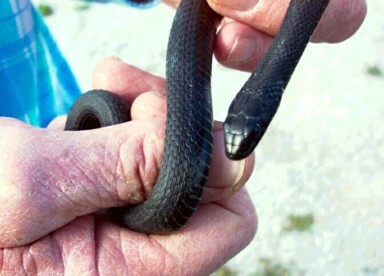 Lewis may have been the first to record this species of snake that makes its home on the Missouri River in Broadwater County. 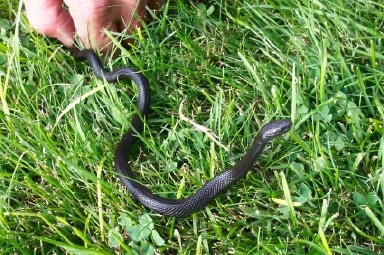 Members of the Crimson Bluffs Chapter have eagerly taken on the project of spreading interest in this rare reptile, the melanistic Wandering Western Terrestrial Garter Snake, Thamnophis elegans vagrans. ...I ordered the canoes to hoist their small flags in order that should the indians see us they might discover that we were not Indians, nor their enemies. 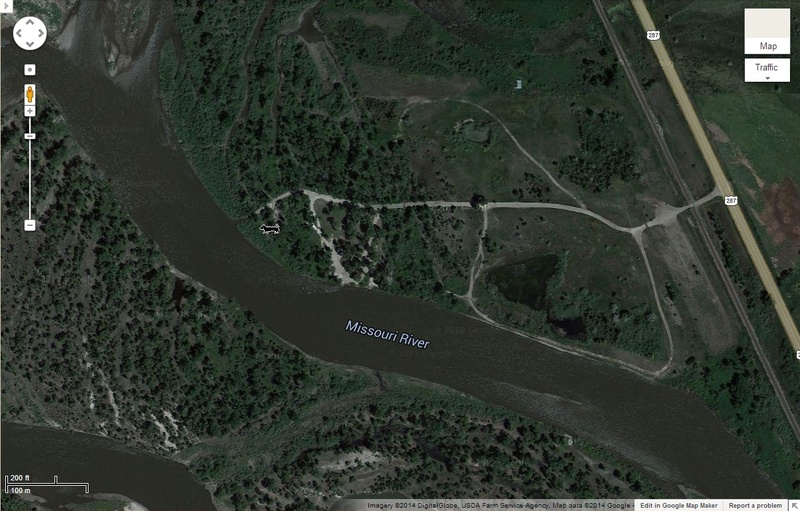 Map Spot “A” is located just north of the Missouri River bridge. Turn west at the Indian Creek Road turnoff. Map Spot A is at the parking area in the short distance between the Indian Creek Road turnoff and the railroad crossing. 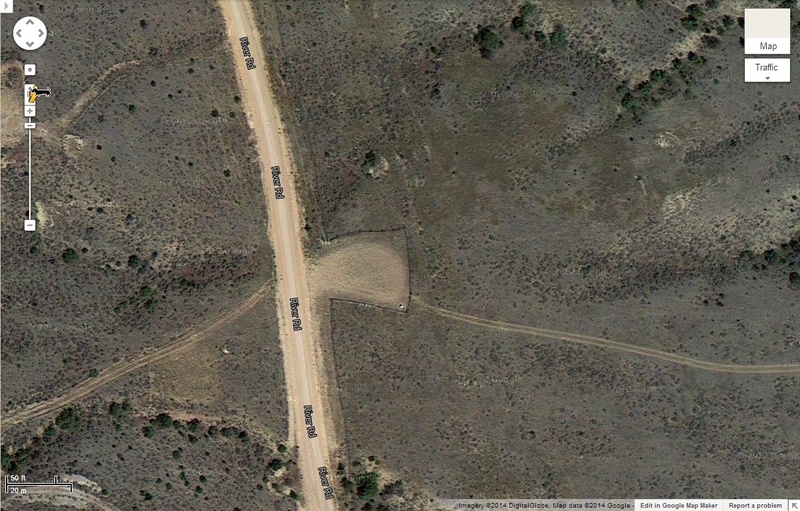 From Map Spot A, cross the railroad tracks. At that point, the road forks—keep left! This is River Road. Very soon the road forks again: keep left on River Road at the intersection with Old Womans Grave Road, and proceed on .05 mile to Point B. There is a parking area here just off River Road, where the Crimson Bluffs interpretive sign is located. Please don’t forget to sign our guestbook! The Bluffs are a short walk from the road. The best view, however, is from the river when the bluffs are lighted by the early morning, mid-summer sunlight, as the members of the Expedition saw them in 1805. Mileage for the Self-Guided Auto Tour begins at the USDA Building, located at 415 S. Front St. in Townsend. Set your odometer to “0”. Use this Travelers’ Guide to proceed on to the sign post markers. This map may appear to have been drawn upside-down, as the North direction is at the bottom of the map instead of North being oriented at the top, as modern maps are printed. As it was not unusual at the time, the Corps of Discovery drew their maps with the top oriented towards the direction they were traveling. Discovery Expedition of St. Charles, Mo. 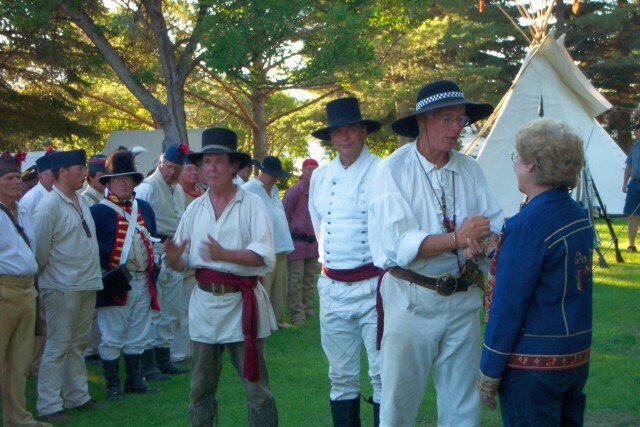 The “Lewis and Clark Discovery Expedition of St. Charles, Missouri” held a reenactment encampment in Townsend in July of 2005 for two nights at Heritage Park. There were approximately 70 Corps, Rotary members and Crimson Bluffs members present. The Corps was in period costume and gave numerous demonstrations. 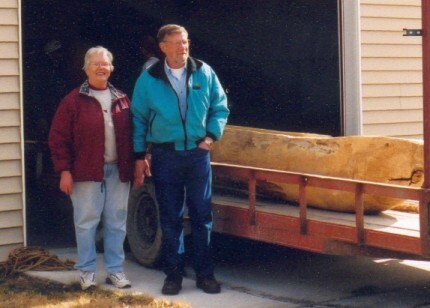 They placed their two dugout canoes in the Missouri River at Yorks Islands Fishing Access Site and demonstrated how they would have been hauled up the river 200 years earlier. Set out at sunrise; the current very strong; passed a remarkable bluff of a crimson coloured earth on Stard. intermixed with Stratas of black and brick red slate. the valley through which the river passed today is much as that of yesterday nor is there any difference in the appearance of the mountains, they still continue high and seem to rise in some places like an amphatheater one rang above another as they receede from the river untill the most distant and lofty have their tops clad with snow. the adjacent mountains commonly rise so high as to conceal the more distant and lofty mountains from our view. I fear every day that we shall meet with some considerable falls or obstruction in the river notwithstanding the information of the Indian woman to the contrary who assures us that the river continues much as we see it. 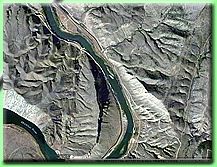 The Crimson Bluffs Chapter is pleased to announce that the U.S. Board on Geographic Names has approved the name Yorks Islands for the group of Missouri River islands in Broadwater County. 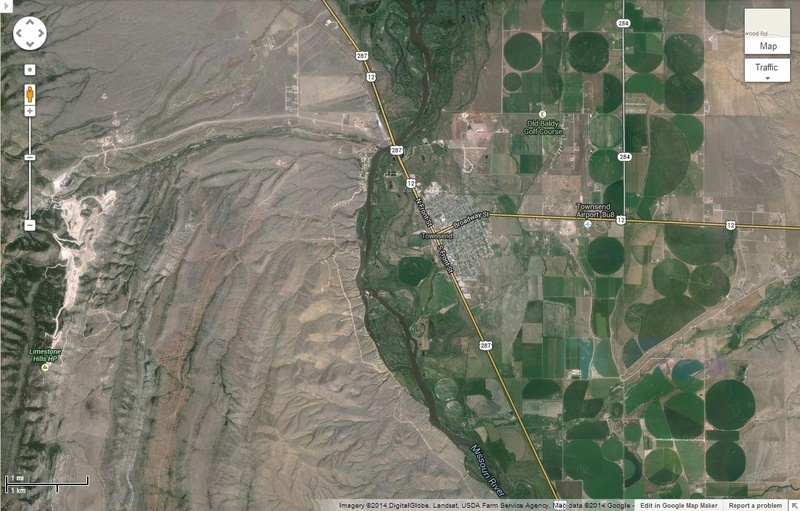 The name was also approved by the Montana Board on Geographic Names and has been entered into the Nation’s official automated geographic names repository. It has been published in the book Decision List 2000. The area fittingly bears the name Yorks Islands in keeping with Clark’s intention to honor his servant and boyhood companion, York. 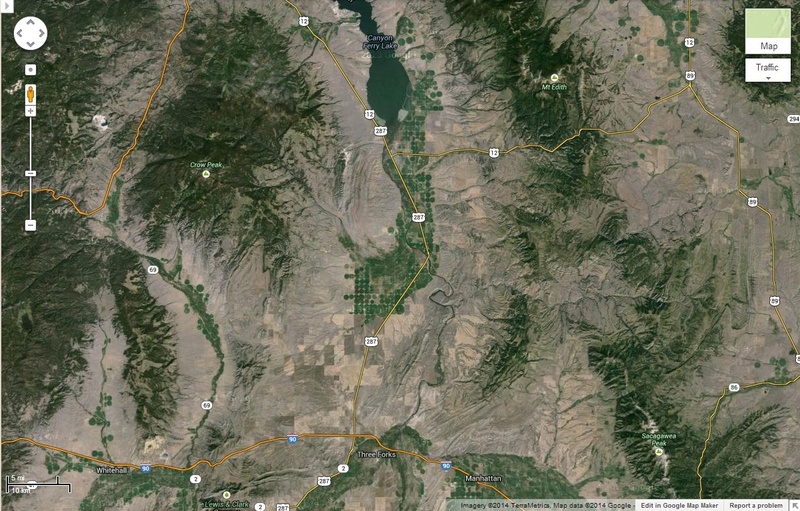 The islands are included on maps in the journals of Lewis and Clark. 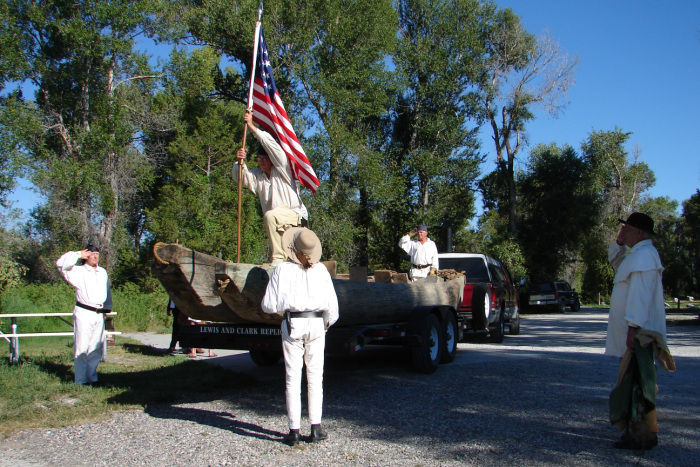 They were joined by historians, representatives of Montana Fish, Wildlife and Parks, and Huel Willis of the Great Falls Lewis and Clark Interpretive Center, portraying “Ben” —York’s cousin. Ben’s character was so convincing, it was a delight to attend. Mr. Willis’ presence was the highlight of the ceremony. Afterwards he was rewarded with a hearty round of applause and presented by Troy Helmick with a framed photo of Yorks Islands. … our trio of pests still invade and obstruct us on all occasions, these are the Musquetoes eye knats and prickley pears, equal to any three curses that ever poor Egypt laiboured under, except the Mahometant yoke. the men complain of being much fortiegued, their labour is excessively great. I occasionly encourage them by assisting in the labour of navigating the canoes, and have learned to push a tolerable good pole in their fraize. This morning Capt. Clark set out early and pursued the Indian road whih took him up a creek some miles abot 10 A.M. he discovered a horse about six miles distant on his left, he changed his rout towards the horse, on approaching him he found the horse in fine order but so wild he could not get within less than several hundred paces of him. he still saw much indian sign but none of recent date. from this horse he directed his course obliquely to the river where on his arrival he killed a deer and dined. in this wide valley where he met with the horse he passed five handsome streams, one of which only had timber another some willows and much stoped by the beaver. 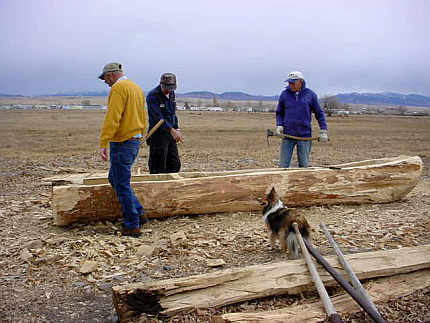 In August 2002 John Ragen provided a cottonwood tree to the Chapter for the building of a dugout canoe. 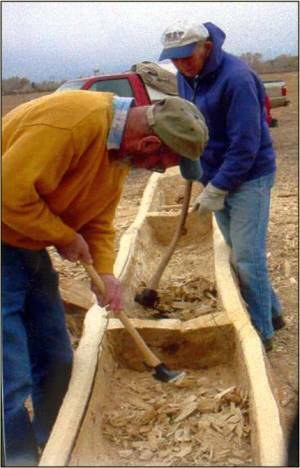 Gene Cook cut the tree down and Maurice Ferrat loaned an “adz” to be used by Troy, John, and others to build the canoe which was a replica of the canoes the Lewis and Clark Expedition used. It is just shy of 16 feet in length and is caulked with native bee’s wax which was sometimes used by the Corps of Discovery. It was completed on March 15, 2003 and moved to the Broadwater County Museum where it is on permanent display. This newspaper article was writen to commorate the construction of the canoe and other activites of Crimson Bluffs Chapter. 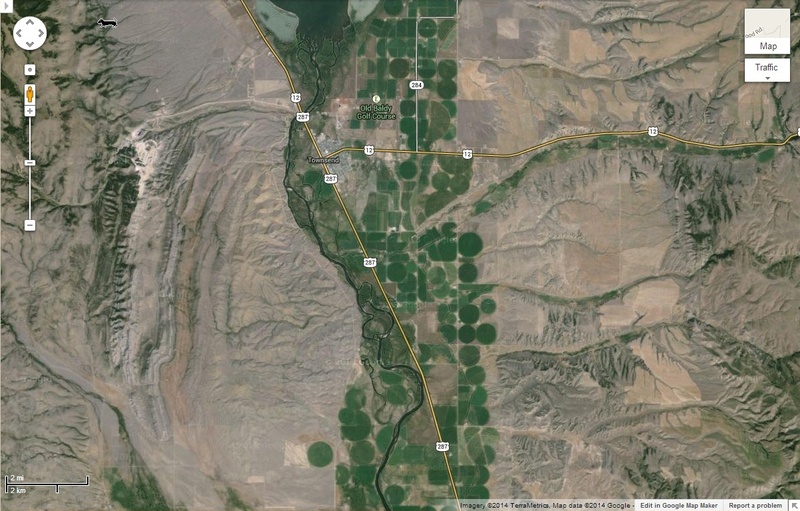 Townsend resident John Stoner lives above a sweeping curve in the Missouri River, just before the river breaks into myriad channels and then balloons into Canyon Ferry Reservoir. 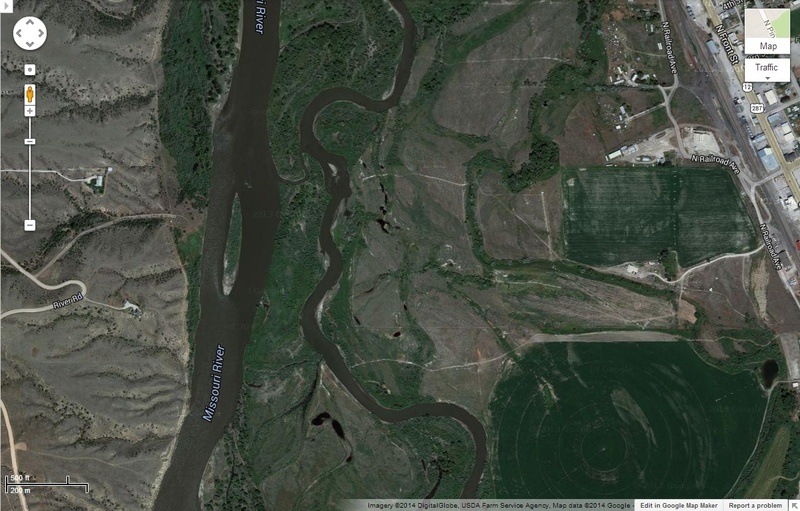 The Lewis and Clark Expedition passed through here, up the river in 1805 and down the next year. Stoner enjoys his proximity to history. 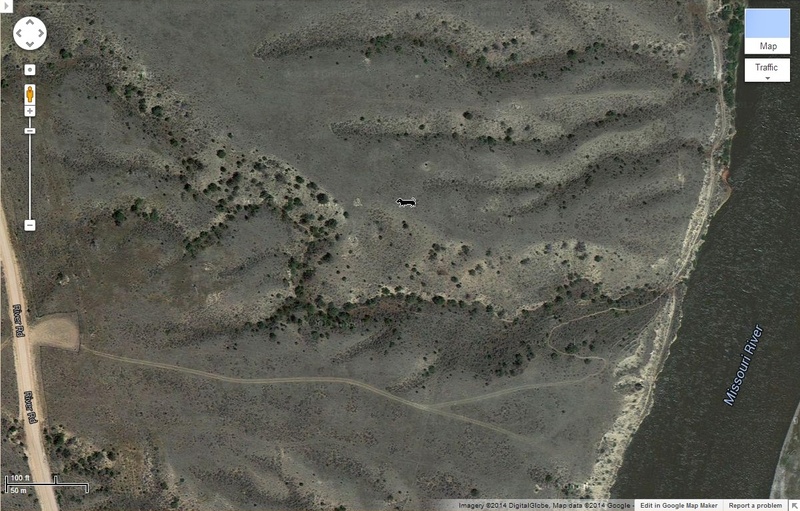 He thinks Clark could have walked through his yard as he scouted in advance of the Corps of Discovery. 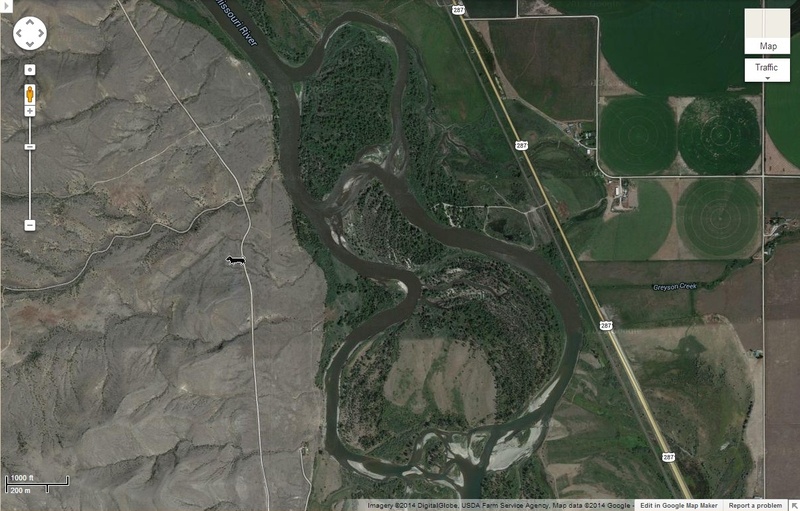 "This is the site that Clark walked up a day ahead of Lewis," he said, motioning beyond a busy Highway 12 bridge that spans the river outside Townsend. "We feel we are living on Clark's footsteps." 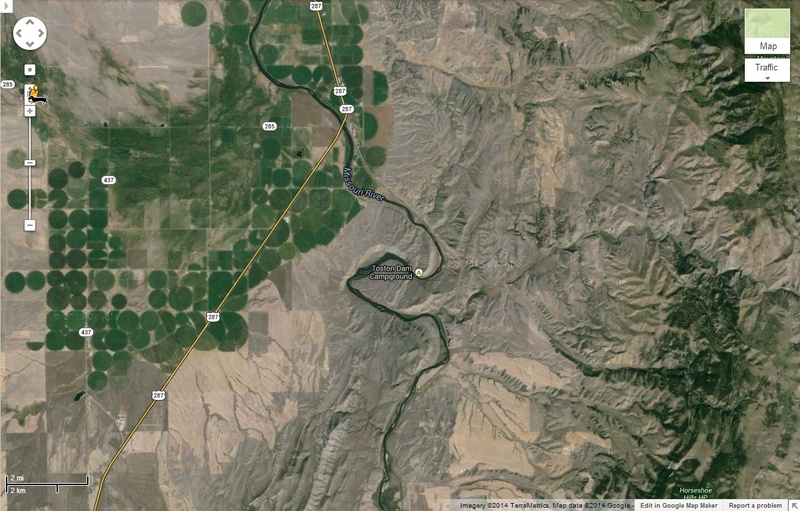 He and pal Troy Helmick have studied and retraced the fabled expedition's trail as they followed the meandering river between the Big Belt and Elkhorn mountains. 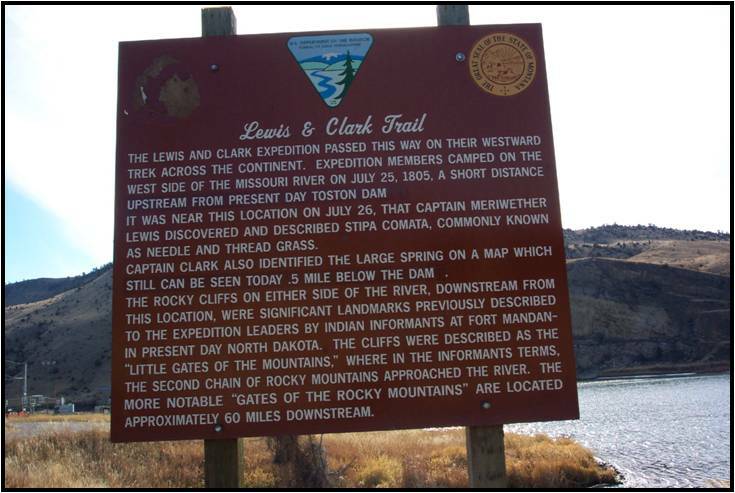 The two play an active part in the Crimson Bluffs chapter of the Lewis and Clark Trail Heritage Foundation. And in anticipation of bicentennial visitors, the group has organized a 40-mile auto tour. 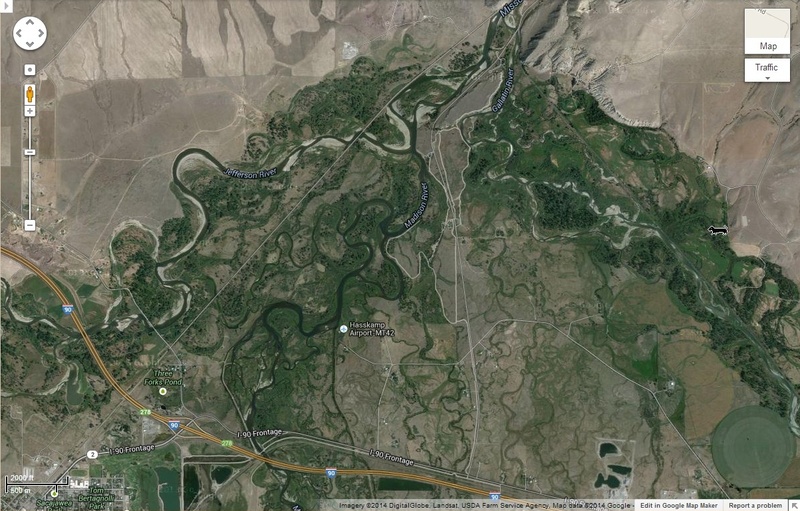 The route starts and ends at the Townsend Ranger District, looping along a gravel road on the river's west bank before returning up U.S. 12. Brochures identifying the area's highlights and interpretive signs marking the route will soon be ready. Other commemorative events of local interest are planned, as well. Helena's Trail Foundation Chapter hosts annual boat-and-dinner trips through the Gates of the Mountains and Hauser Lake. The Gates of the Mountains chapter concentrates on education, said President Ann Tedesco. 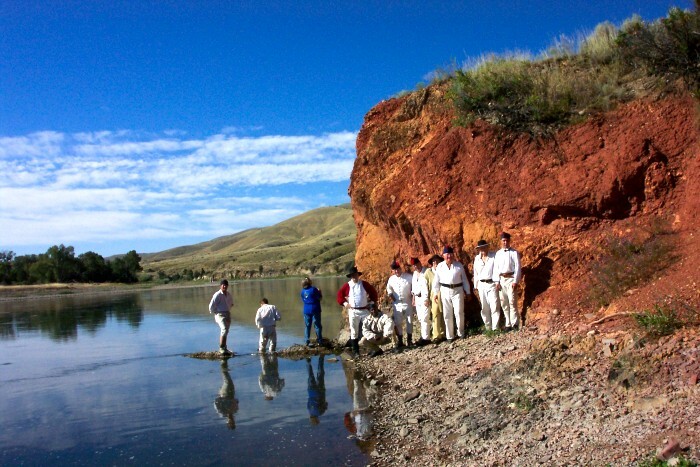 Monthly lectures on various aspects of the expedition are offered. 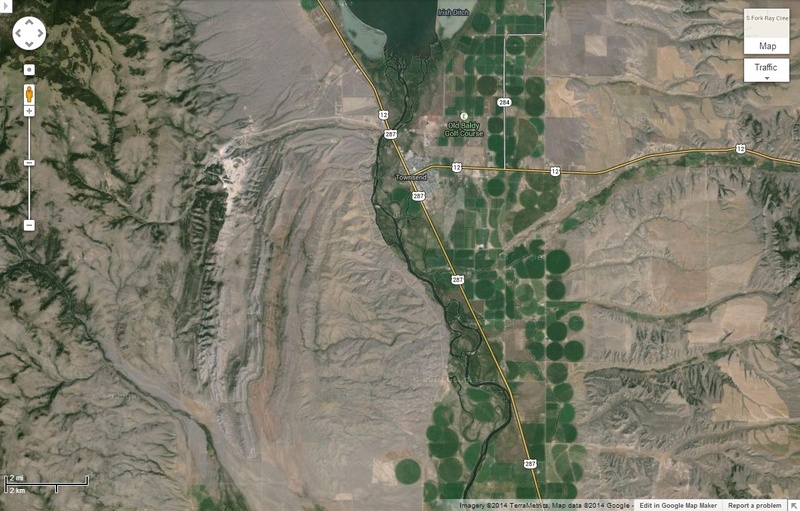 Next up is anthropologist Sara Scott, bicentennial heritage coordinator for the Helena National Forest, who will give a slide talk next month on the landscapes the Corps of Discovery found as they approached the Missouri River headwaters. On Feb. 24, Scott will talk about how the corps was forced to drag their boats through low water, making progress slow and tedious. Chapter membership dues help pay for such presentations, Tedesco said. Montana Historical Society scholars George Oberst and Rich Aarstad will host monthly book discussions about the expedition at the Townsend library. The library will loan books to participants; the first talk is Feb. 27. While other Montana sites might attract more attention during the bicentennial, Townsend shouldn't be overlooked, locals said. 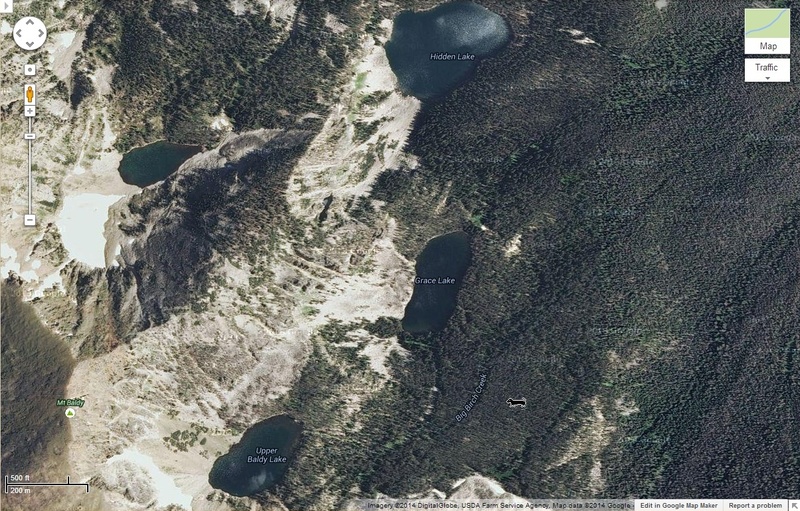 "You would assume they took a bus from Gates of the Mountains to the headwaters," Helmick said. 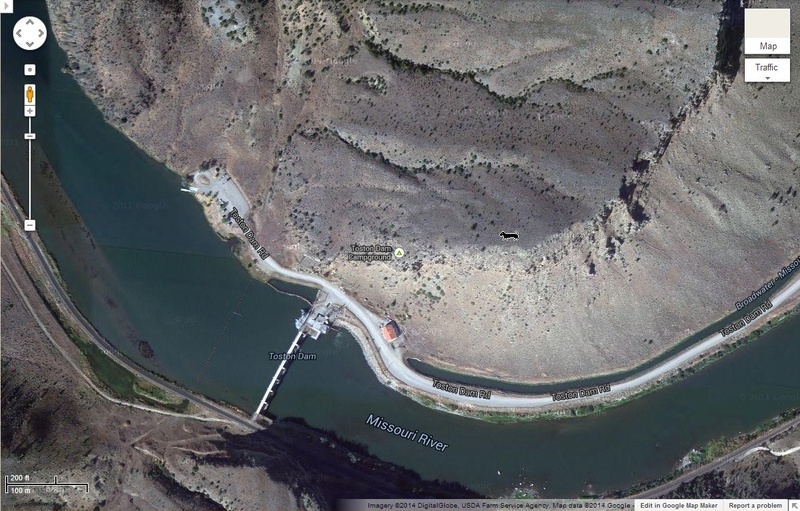 The Missouri River south of Townsend keeps pretty much the same channel it did 200 years ago, whereas the Great Falls are no longer visible and other sites lie submerged in Canyon Ferry Lake. 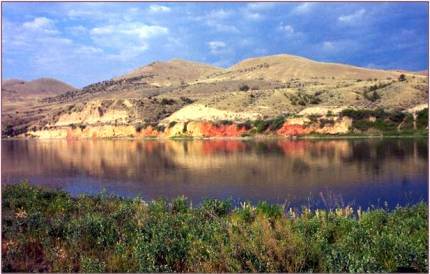 As he drove along the auto tour's hilly route, Helmick pointed out other sights Lewis and Clark recorded — places he and Stoner know well: Crimson Bluffs, a red-hued cliff; Yorks Islands, named in honor of the expedition's sole black member; and the narrow entry into the Second Gates of the Mountains. 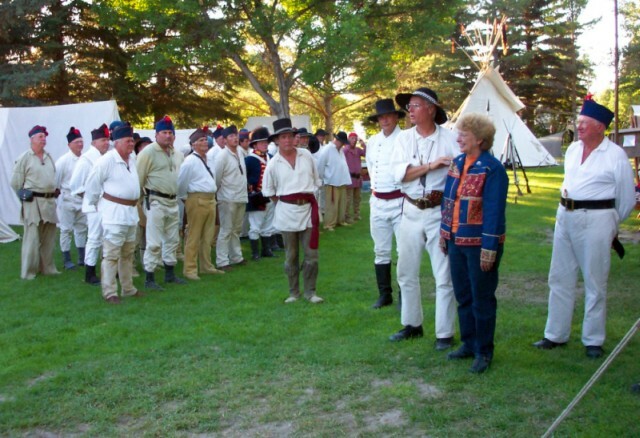 Springs, campsites, and Clark's overland trail are easy to find or imagine with the commanding view afforded on the west side of the Missouri. It's amazing to see today the natural details that were recorded on expedition maps and in journal notes, Helmick said. 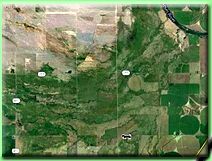 For example, he said, Clark refers to a single line of trees that run along only one of five streams that drain into the river, presently called Crow Creek. Today, trees still line only one stream. Development once threatened to overrun the club's namesake site, Crimson Bluffs. 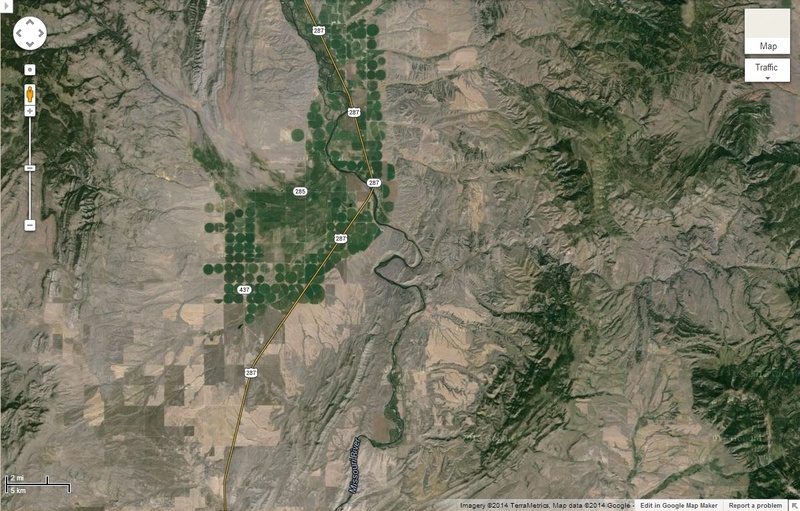 But thanks to the efforts of public lands groups and Montana's Congressional contingent, the site was set aside last year. 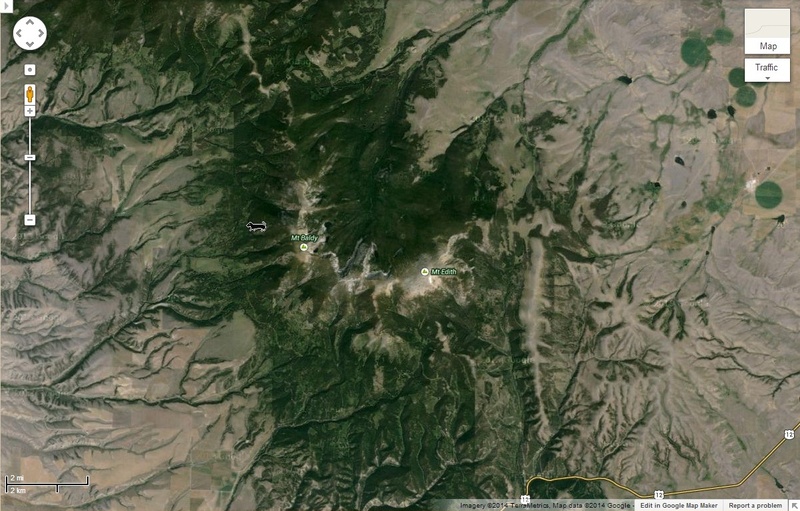 Fifty acres around the bluffs are now under the auspices of the Bureau of Land Management and are accessible to hikers. Preserving the area's historical legacy is important to Helmick and Stoner. 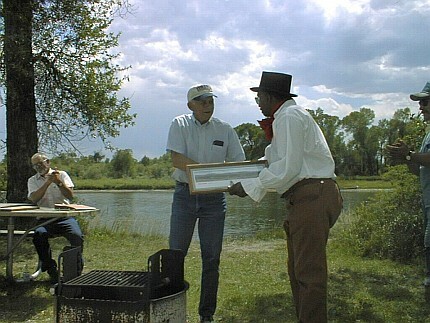 It is similarly obvious that the two want to share their hard work and enthusiasm for a piece of the Lewis and Clark Trail. 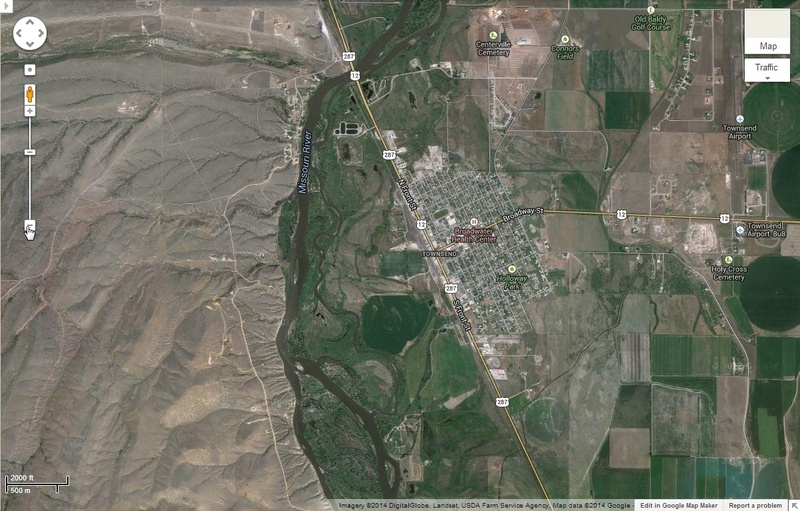 "From here to Three Forks the river is basically unchanged," Stoner said. "You can take the journals and follow [the Corps]." ...I observed that the rocks which form the clifts on this part of the river appear as if they had been undermined by the river and by their weight had seperated from the parent hill and tumbled on their sides, the stratas of rock of which they are composed lying with their edges up; others not seperated seem obliquely depressed on the side next the river as if they had sunk down to fill the cavity which had been formed by the washing and wearing of the river. …the mountains on either Side appear like the hills had fallen half down & turned Side upwards the bottoms narrow and no timber a fiew bushes only. Crimson Bluffs Chapter, Lewis and Clark Trail Heritage Foundation created and maintains the Corps of Discovery display at the Broadwater County Museum. The museum is located at 133 N. Walnut St., Townsend, Montana, and is open to the public from May 15 through Sept. 15 and from 1:00 – 5:00. 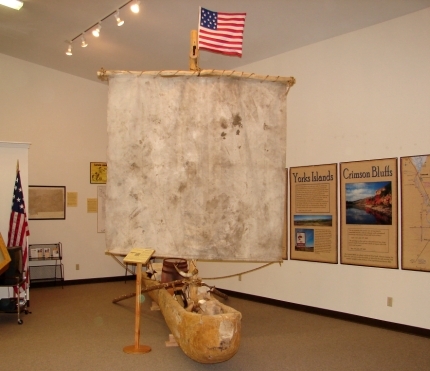 The Corps of Discovery exhibit includes a dugout canoe replica, maps, photographs of local sites, enlargements of the Self-Guided Auto Tour, and the Chapter’s archival documents. Three informational kiosks commemorating the Lewis and Clark Expedition were installed along Highway 12/287. The kiosks are located at Winston near the Winston Bar; at the Indian Creek Campground, on the south bank of the Missouri River bridge near Townsend; and at Three Forks, across the street from the Sacagawea Hotel. Funding for the three kiosks came from a Forest Service Rural Community Assistance grant, a National Park Service grant, the Bureau of Reclamation, Broadwater County. Kiosk research informational documents provided by Crimson Bluffs Chapter. ...the high lands are thin meagre soil covered with dry low sedge and a species of grass also dry the seeds of which are armed with a long twisted hard beard at the upper extremity while the lower point is a sharp subulate firm point beset at it's base with little stiff bristles standing with their points in a contrary direction to the subulate point to which they answer as a barb and serve also to pres it forward when onece entered a small distance. these barbed seed penetrate our mockersons and leather legings and give us great pain untill they are removed. my poor dog suffers with them excessively, he is constantly hinting and scratching himself as if in a rack of pain. a fair morning wind from the South. I Set out by land at 6 miles overtook G Drewyer who had killed a Deer. we killed in the Same bottom 4 deer & a antelope & left them on the river bank for the Canoes proceeded on an Indian roade through a wider Vallie which the Missouri Passes about 25 miles & Camped on the bank of the river, High mountains on either Side of the Vallie Containing Scattering Pine & Cedar Some Small Cotton willow willow &c. on the Islands & bank of the river I Saw no fresh Sign of Indians to day Great number of antelopes Some Deer & a large Gangue of Elk. 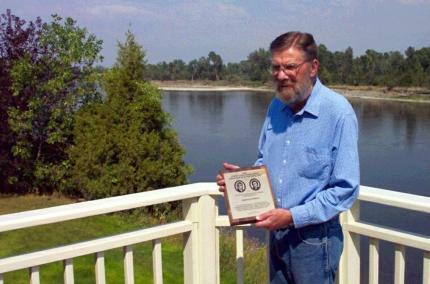 In August of 2003, Hal Price was awarded one of only four Distinguished service Awards given nationally by the Lewis and Clark Trail Heritage Foundation. Due to his failing health, his son Marshall accepted the award for him in Philadelphia. 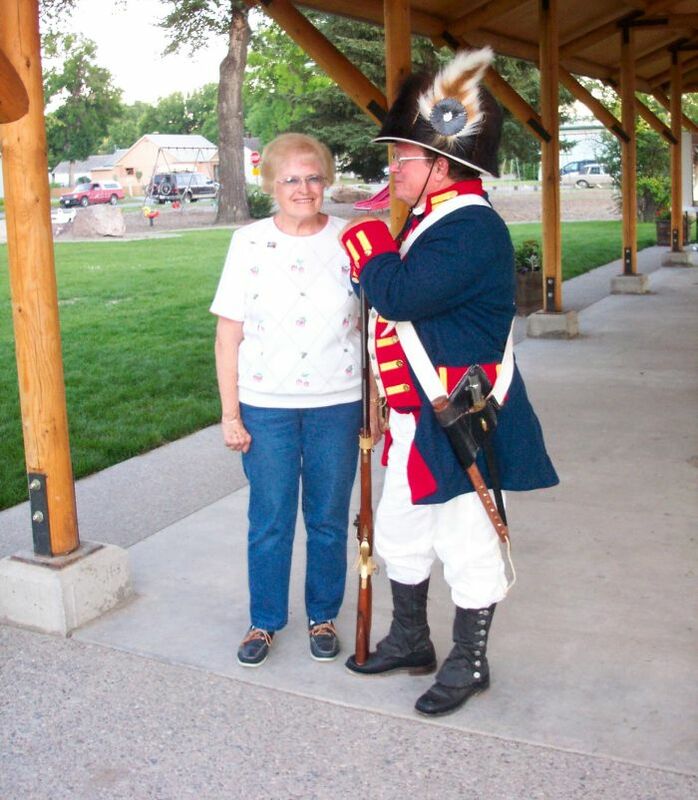 Hal was one of the leading locals who helped form the Crimson Bluffs Chapter of the Lewis and Clark Trail Heritage Foundation in Townsend. 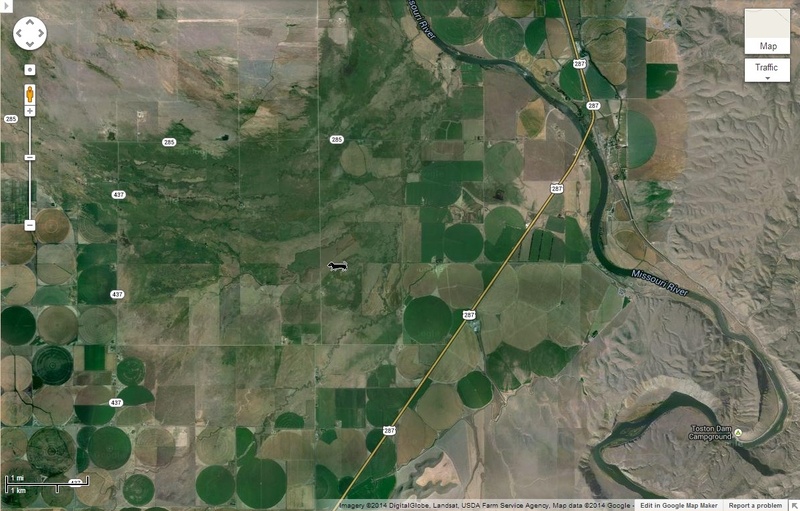 In 2008, the Highway Department removed this Lewis and Clark Map Spot “S” sign, and the Chapter has not replaced it. 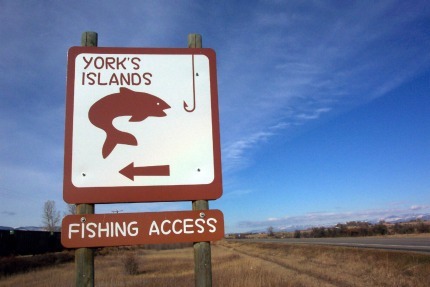 However, Yorks Islands is easy to find with this fine, bold Fishing Access sign located 3.6 miles south of Townsend. ...here the hills or reather mountains again recede from the river and the valley again widens to the extent of several miles with wide and fertile bottom lands. covered with grass and in many places a fine terf of greenswoard. July 18, 1805. 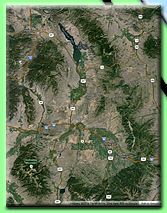 Captains Lewis and Clark, anxious to contact the natives to acquire horses and geographic information, decided to divide the party. July 20, 1805. 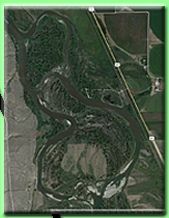 Captain Clark, with his “small partey”, York, Joseph Fields and John Potts, left the Missouri River and walked up Spokane Creek, following what Clark referred to in his journal as “an Indian roade.” They saw smoke about 12 miles up the valley of the last creek but failed to contact any Indians. 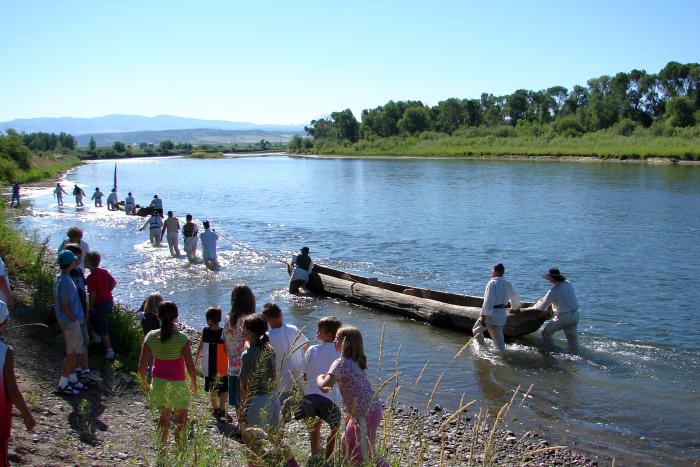 They crossed from Spokane creek to Beaver creek and walked back to the Missouri River. Clark decided to let the men rest, treat their sore feet, hunt, explore up and down the river and wait for Capt. Lewis. July 21, 1805. Capt. Lewis and the main party with eight dugout canoes, “all heavily laden,” entered what is now the Townsend valley. “…the country was rough mountainous & much as that of yesterday until towards evening when the river entered a beautiful & extensive plain country of about 10 or 12 miles wide which extended upwards further than the eye could reach… this valley is bounded by two nearly parallel ranges of high mountains which have their summits partially covered with snow.” –Lewis Journal. July 22, 1805. “The Indian woman recognizes the country and assures us that this is the river on which her relations live, and that the three forks are at no great distance. this peice of information has cheered the sperits of the party who now begin to console themselves with the anticipation of shortly seeing the head of the missouri yet unknown to the civilized world. the large creek we passed on Stard we call White Earth Creek from the circumstance of the natives procuring a white paint on this crek” –Lewis Journal. Capt. Lewis along with the main party rejoins Capt. Clark’s small party and they camped together a few miles above Beaver Creek. 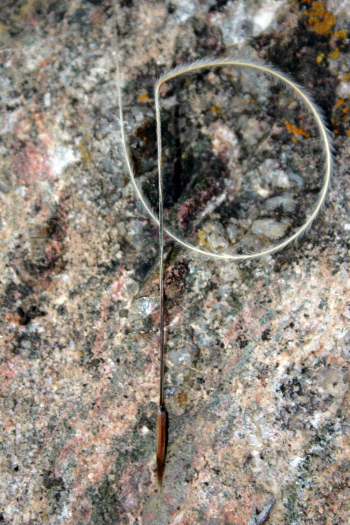 Captain Clark recorded “one fusee found” (a lightweight flintlock musket!). 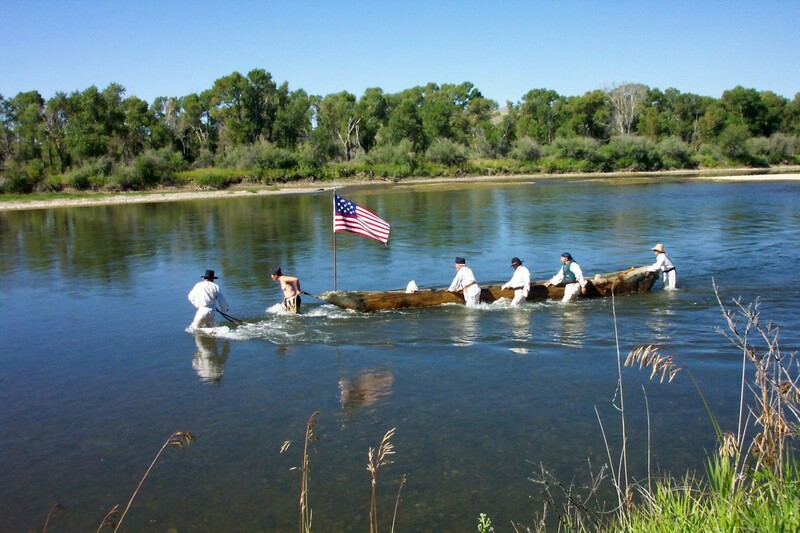 Captain Lewis led the main party with eight dugout canoes through the Townsend valley and camped on an island about two miles north of the Missouri River bridge. 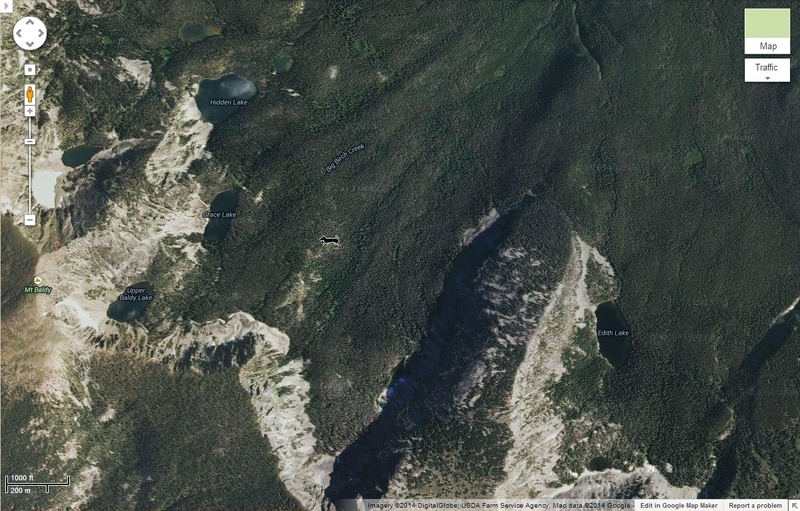 All campsites July 20 through July 23, 1805 are now covered by Canyon Ferry Reservoir. 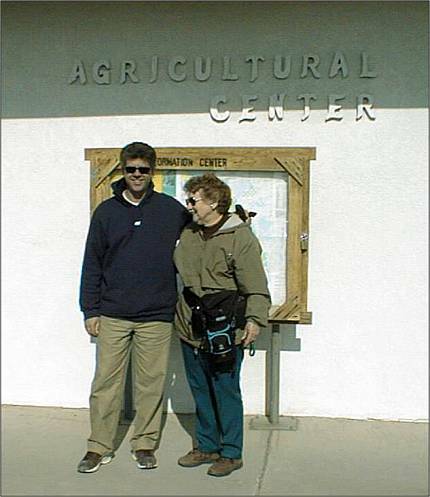 Begin the Self-Guided Auto Tour at the Agriculture Center, Forest Service Office on Front Street in Townsend, Montana. 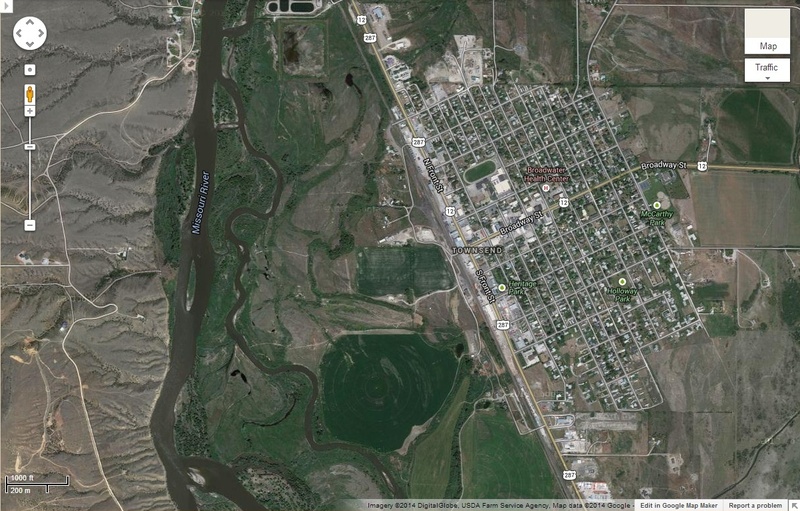 Travel north 1.7 miles (through Townsend) on Front Street/ Highway 12/287, across the Missouri River bridge to Point A.
July 23, 1805. Captain Clark again left the main party to travel ahead on foot in hopes of finding the native people before they might be frightened away by the size of the main party. Robert Frazier, Joseph Field, Reubin Field and Charbonneau accompanied him. They “…proceeded on an Indian roade through a wide Vallie which the Missouri Passes…” (Their route passed near Point A). 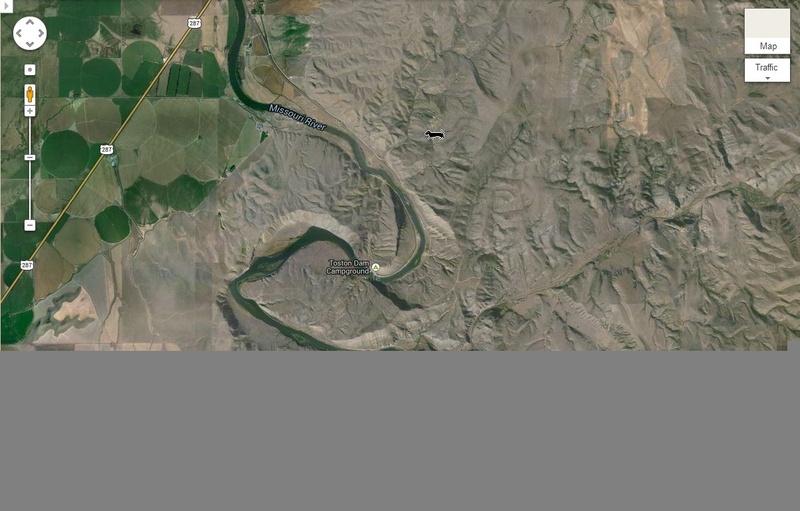 They camped that night on the west side of the Missouri River between Dry Creek and Crow Creek (you will pass the site later on the tour—see map). 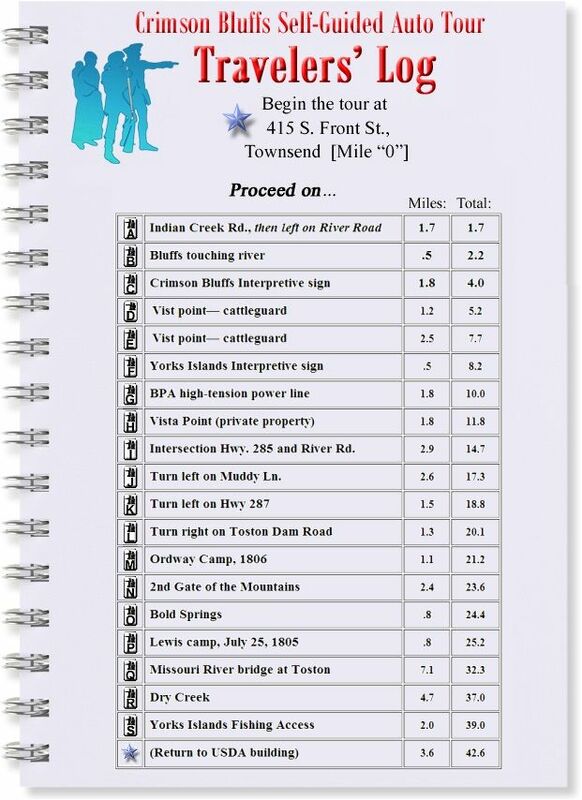 From Point A, turn left on Indian Creek Road, cross railroad tracks, turn left on River Road, cross Indian Creek, turn left again on River Road at intersection with Old Womans Grave Road, and proceed on 0.5 mile to Point B. 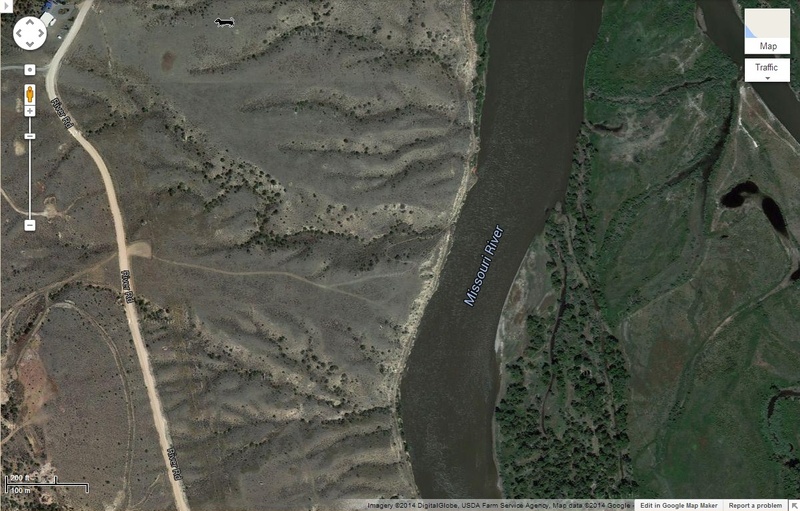 From Point B, continue traveling upstream on River Road, a winding, hilly gravel road, which is situated in very close proximity to the trail Capt. 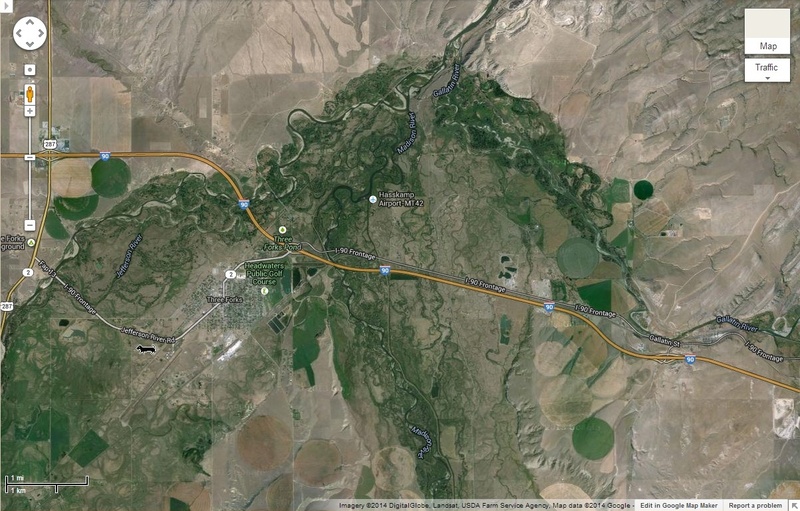 Clark and his party traveled on July 23, 1805. 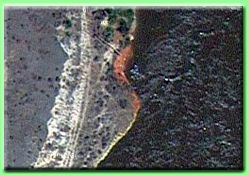 Travel 1.8 miles to Point C. At Point C on the left side of River Road (on BLM Property) is the Crimson Bluffs interpretive sign. Here you can read and enjoy the sign, from which it is a short walk down to the Bluffs. 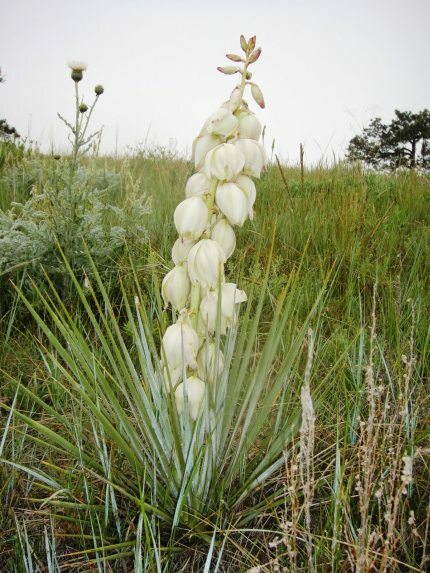 The best view, however, is from the river when the bluffs are lighted by the early morning, mid-summer sun-light, as the members of the Expedition saw them in 1805. July 24, 1805. Traveling through the Indian Creek area, Captain Lewis and the main party passed the Crimson Bluffs and Yorks Islands, and camped that night west of the river near the mouth of Dry Creek. “…passed a remarkable bluff of crimson coloured earth on Starboard intermixed with Stratas of black and brick red slate.” —Lewis Journal. “The morning was fine, and we early prosecuted our voyage; passed a bank of very red earth, which our squaw told us the natives use for paint.” —Sgt. Gass Journal. Capt. 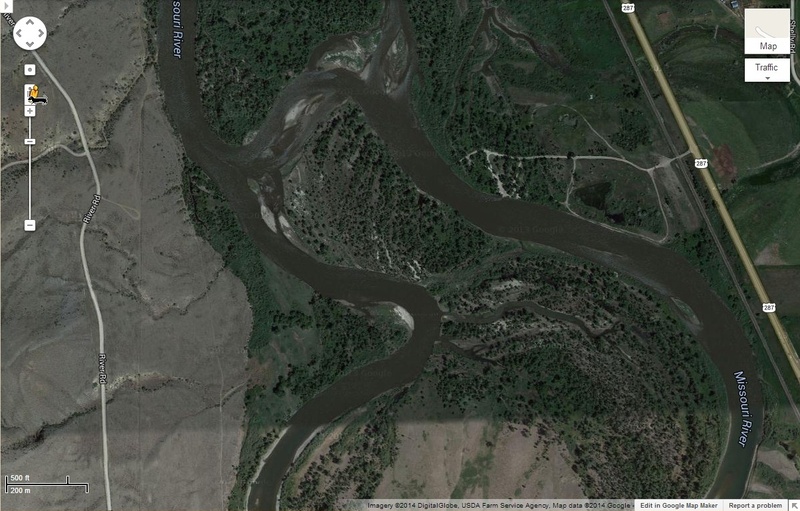 Clark and his small party continued on foot along the west side of the Missouri River. They traveled across Crow Creek Valley where they saw a horse but were not able to get close to it. They “crossed 5 handsom streams in one vallie,” then changed their direction back to the river. 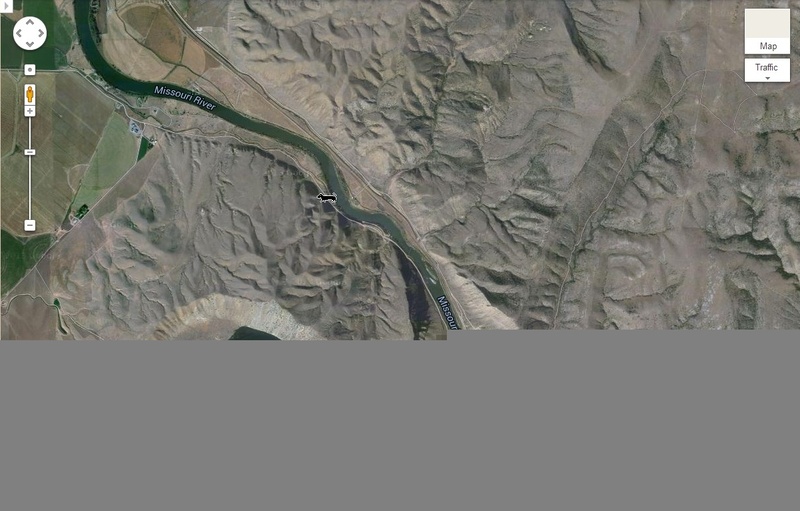 The small party camped that night west of the Missouri River near the present town of Clarkston. 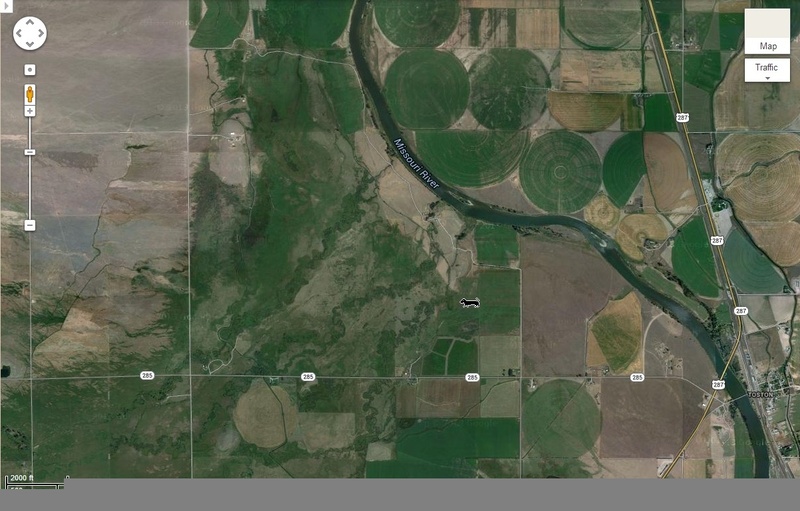 From Point C, continue on River Road 1.2 miles to Point D on the left side of River Road, a short distance north of the cattle guard. 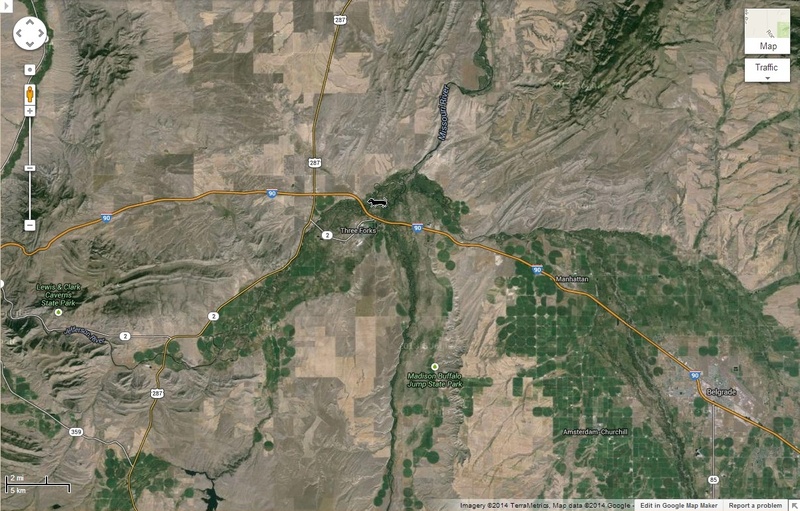 This prominent point provides a clear view of the beautiful and extensive valley, the river, the bluff and the parallel range of high mountains, which had “…their summits partially covered with snow,” when described by Capt. Lewis on July 21, 1805. From Point D, proceed on along River Road 2.5 miles to Point E. From here, the north end of Yorks Islands are visible to the east. 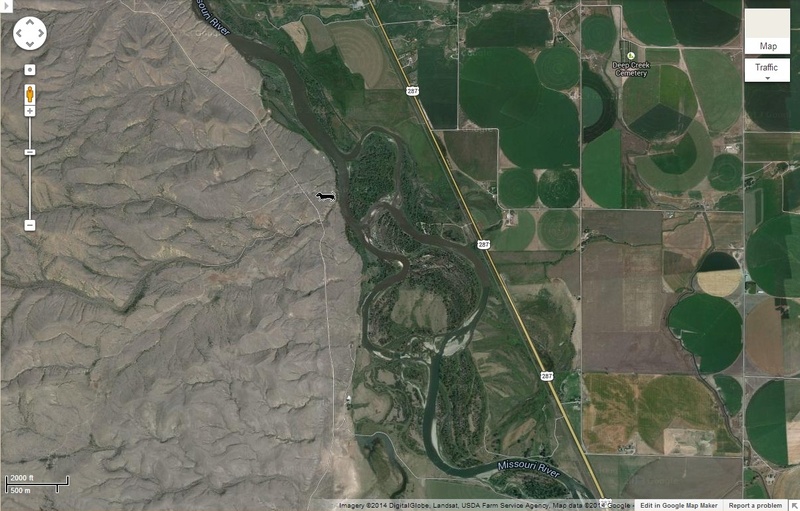 Continue 0.5 mile on River Road to Point F, to the Yorks Islands interpretive sign, located on the left side of the road on BLM property. Read and enjoy the sign, a short hike to the top of the hill southwest of the site provides an outstanding view of the Islands. Continue 1.8 miles to the BPA power line crossing (Point G). 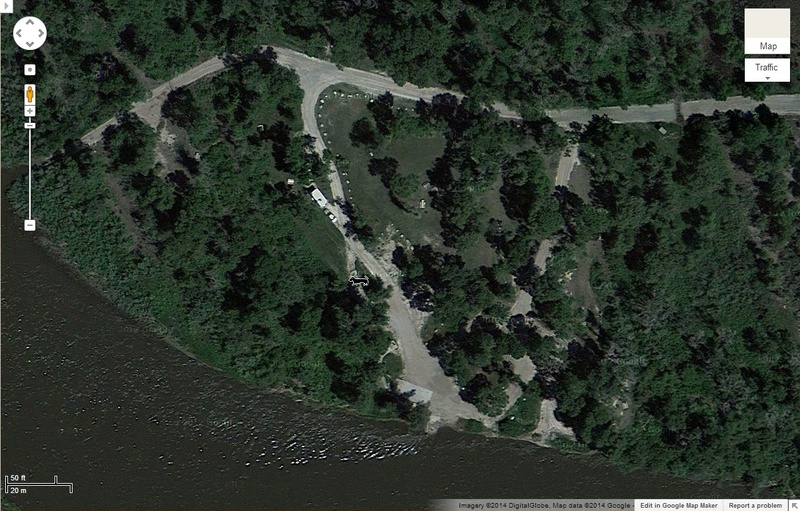 From Point G, continue 1.8 miles to Point H, located on private property on the right side of River Road. This vista is an outstanding observation point. Two miles to the northeast is Captain Lewis’ campsite of July 24, 1805. One mile east is Capt. 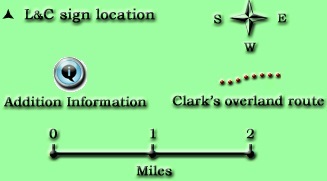 Clark’s campsite of July 23, 1805. 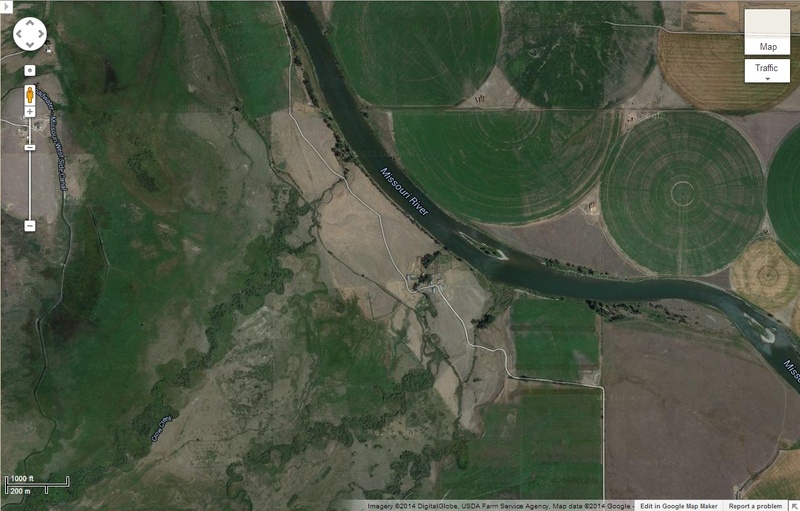 Three miles southeast, behind the island in the Missouri River, is Crow Creek which Capt. Lewis named “Gasses Creek” after Sgt. Patrick Gass. 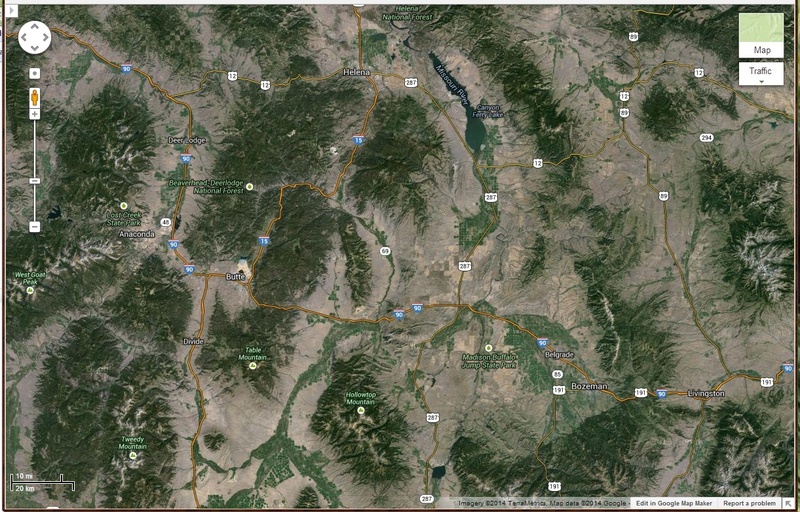 The area south and southwest of here is the Crow Creek Valley. July 24, 1805 Capt. 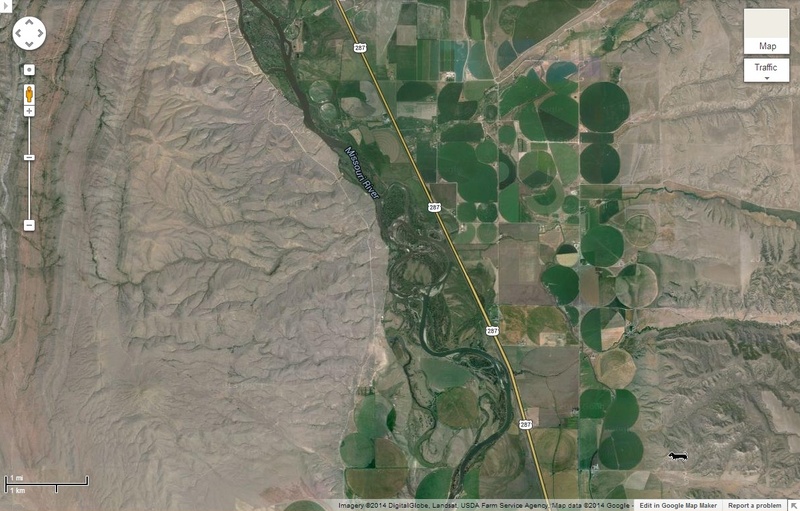 Clark with his small party spotted a horse and recorded, “Crossed five handsom Streams in one Vallie one only had any timber on it one other Willows only and a number of Beaver Dams.” —Clark Journal. 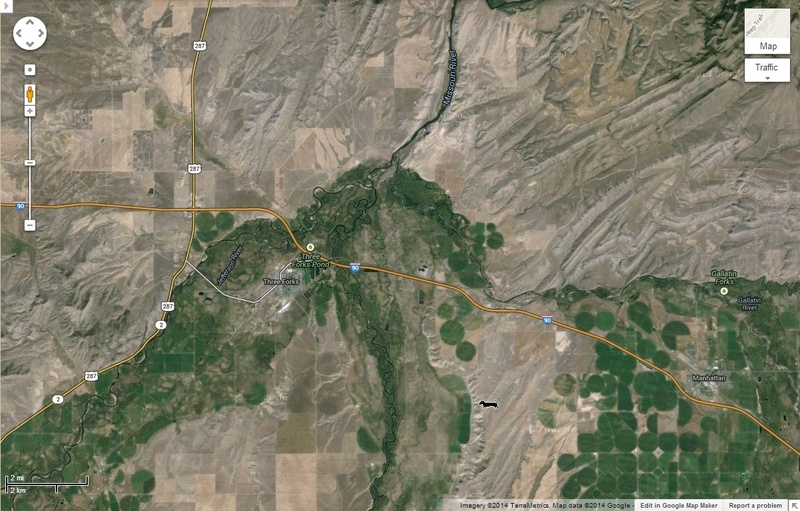 At Point J, turn left onto Muddy Lane, and travel east 1.5 miles to Point K at Highway 287. Clark’s trail was about 2 miles southeast of Point K, along the hillside. 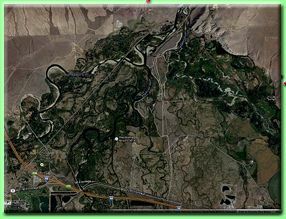 At Point K, turn left and travel 1.3 miles along Highway 287 to Point L, turn right and proceed east along Toston Dam Road 1.1 miles to Point M.
[Return trip, following year, July 13, 14, and 15, 1806:] Sergeant Ordway, with 9 men and 6 canoes, came back down the Missouri River from the Pacific Ocean to St. Louis. 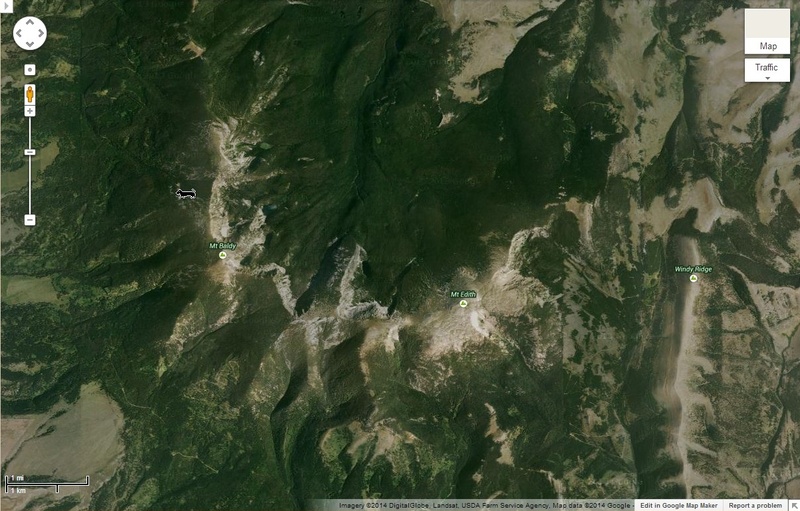 While the location of their campsites is uncertain, the approximate location of the July 14, 1806, campsite of Sgt. 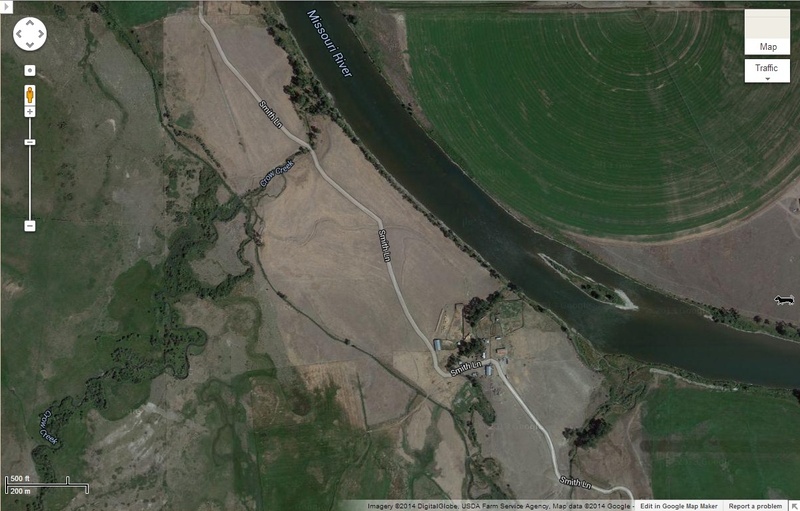 Ordway and the canoe party is to the north across the river at Point M, about 1.5 miles upstream from Toston. 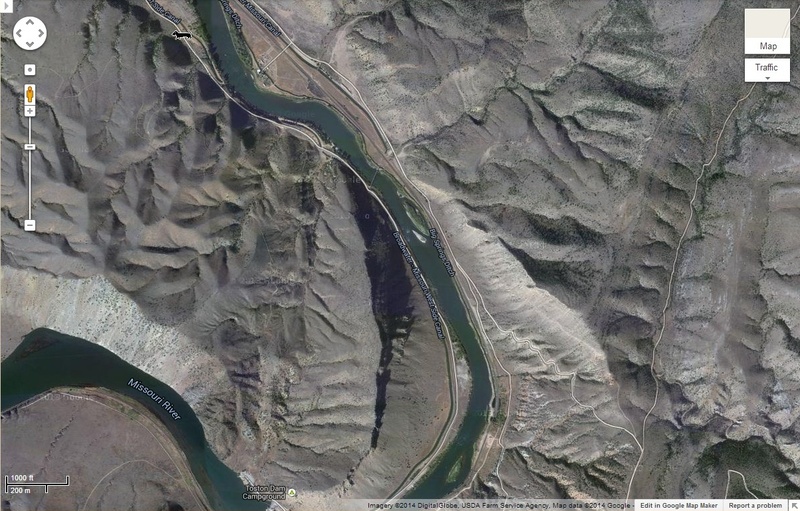 Continue along Toston Dam Road 2.4 miles to Point N, 0.8 mile to Point O, then 0.8 mile to Point P.
...which is located at (Point N), then passed “fine bold springs” (Point O), and camped that night just above the present Broadwater Missouri Diversion Dam (Point P). An interpretive sign is located near the site of Lewis’ camp. 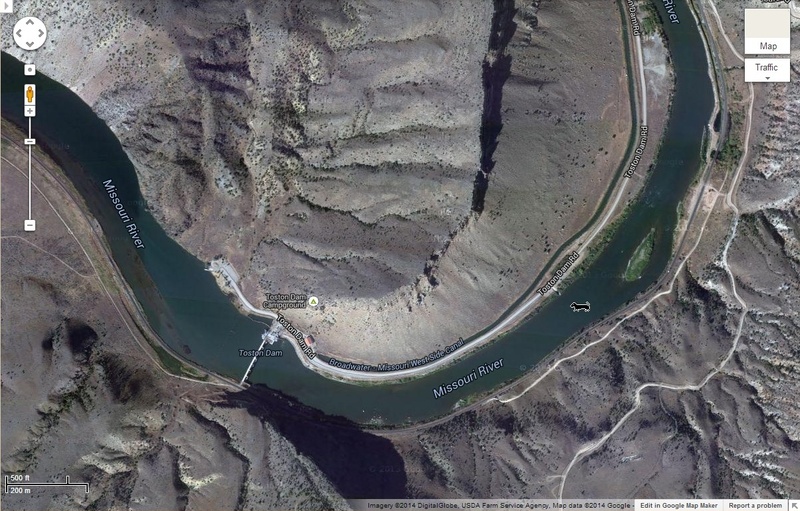 River access, a boat ramp, picnic tables and other facilities are available at the site and at the Ray Doig Memorial site located a short distance below the dam. July 25, 1805. Capt. 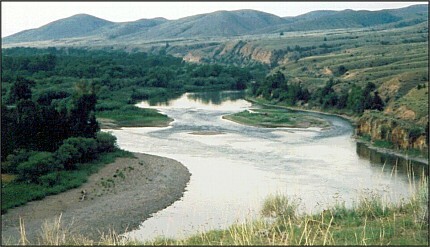 Clark, with his small party, continued up the Missouri River to the Three Forks and explored farther up the Jefferson River. 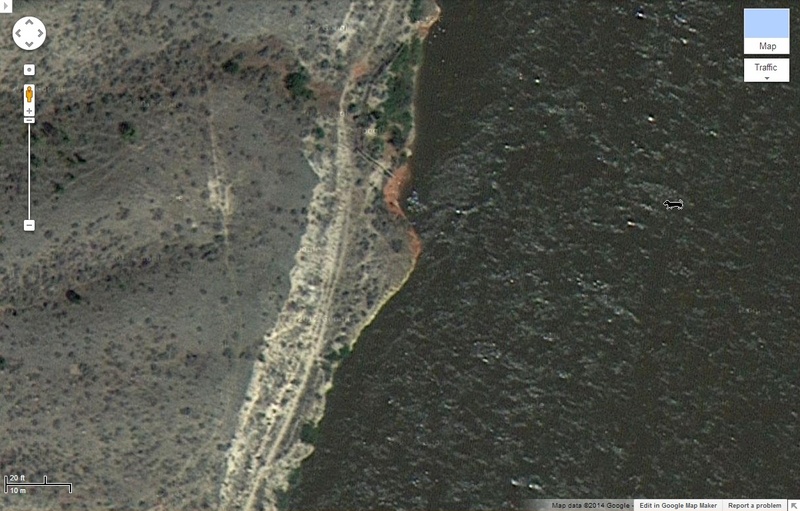 From Point R, continue north along Highway 287 to Point S, located at the Yorks Islands Fishing Access turn-off. 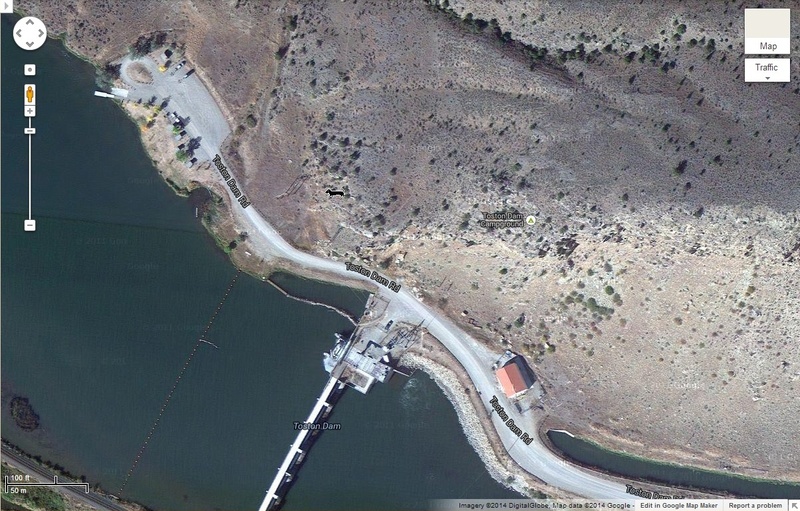 Yorks Islands Fishing Access Site offers a boat ramp, picnic tables, camping area and interpretive sign located 0.4 miles west of Highway 287. 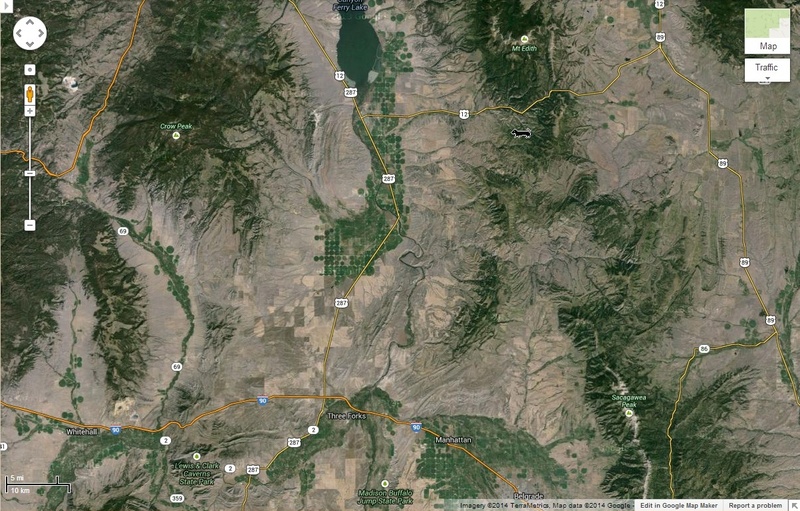 From Point S, drive 3.6 miles back to the Agriculture Center in Townsend to complete the Self-Guided Auto Tour of the Lewis and Clark Trail through the Townsend Valley. July 22, 1805. Captain Lewis recorded that he saw: “both species of the willow broad & narrow leaf, rose bush, small honesuckle, pulpy leafed thorn, southernwood, sage Box alder, narrow leafed cottonwood, red wod, a species of sumac are all found in abundance as well as black gooseberrie, service berries, choke cherries and the currants of four distinct colours of black, yellow, red and perple”. 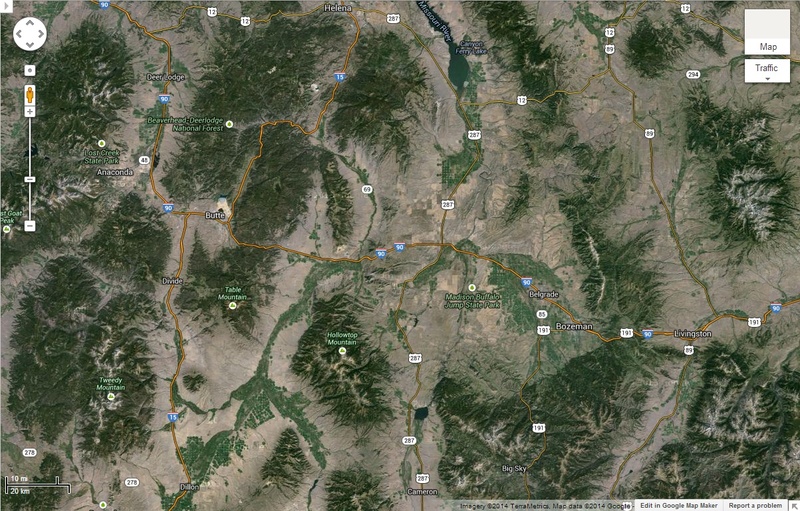 All trail and campsite locations are approximate. 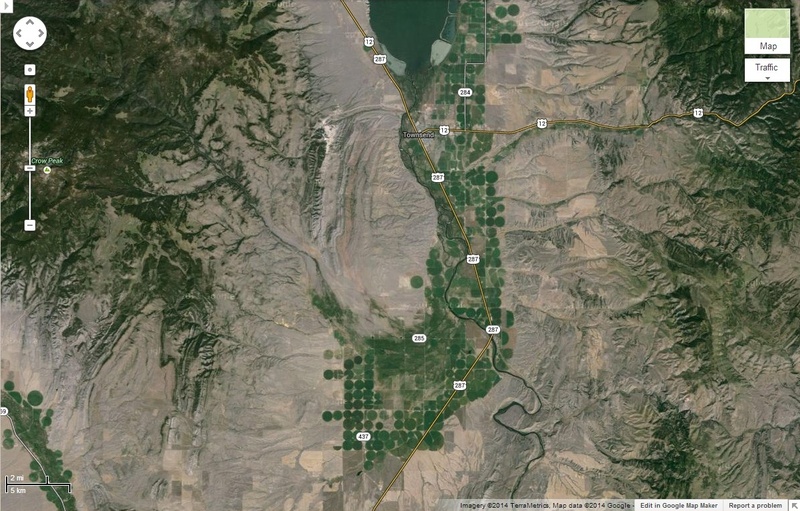 Some sites lie on private land. While traveling the route of this Self-Guided Tour, please exercise reasonable and prudent caution. When parking or driving slowly, be aware of traffic, especially on winding, hilly gravel roads. 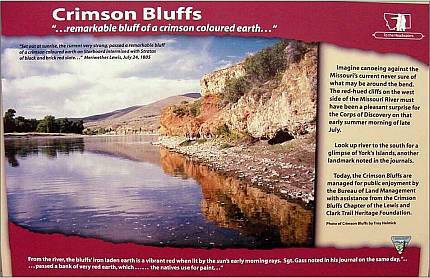 There are designated parking areas at the Crimson Bluffs interpretive sign; interpretive signs are also located at the Broadwater Missouri Diversion Dam and at Yorks Islands Fishing Access. Interactive map by Mike Castleberry. Historical data provided by Troy Helmick, Hal Price, John Stoner.